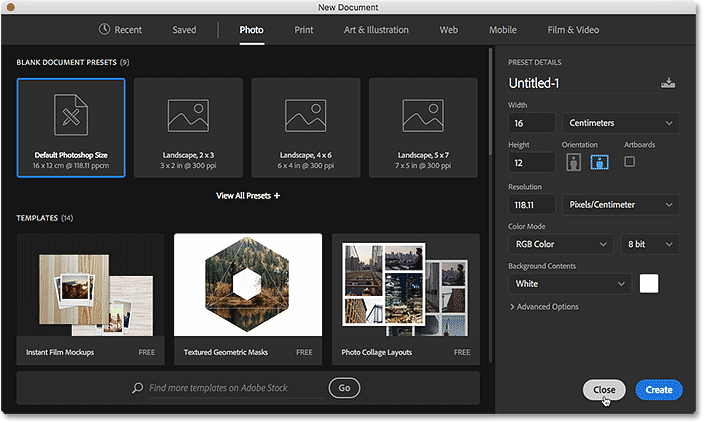 In the previous tutorial, we learned all about the Start screen (the Start workspace) in Photoshop and how it serves as a great starting point for our work by letting us create new Photoshop documents, open existing images, or re-open any recent files, all from a single, convenient location. 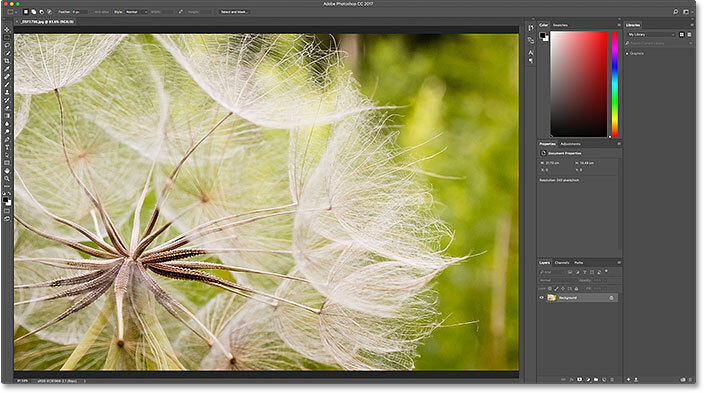 There's no doubt that the Start screen was a great new addition back in Photoshop CC 2015 and its recent update in CC 2017 makes it even more useful, especially for beginner Photoshop users. Yet the fact is, we've been able to create new documents and open images since long before the Start screen came along, and we can still do so today without using the Start screen. 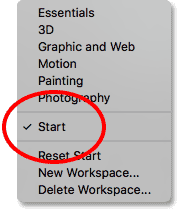 Adobe knows that not everyone will want to use it, which is why they included an option to disable the Start screen, as we'll see in a moment. Yet if we disable the Start screen, how do we create new Photoshop documents? How do we open images? How do we re-open our recent files? 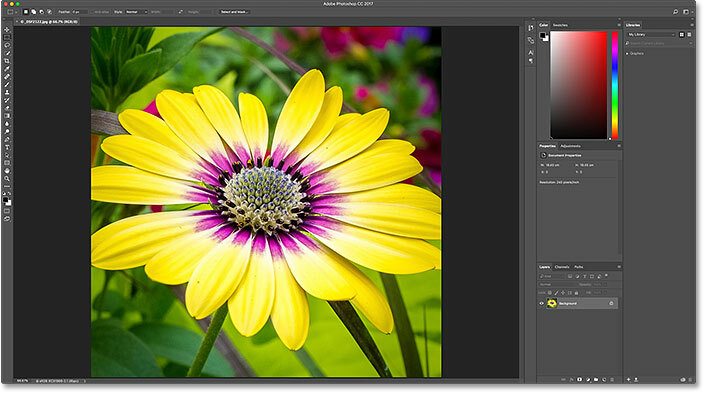 In this tutorial, we'll learn how to do all of these things very easily using a few old school Photoshop commands that are still available to us even in the most recent version of Photoshop. Keep in mind that I'm in no way trying to convince you to stop using the Start screen. If you like it, great! It really is a useful feature. 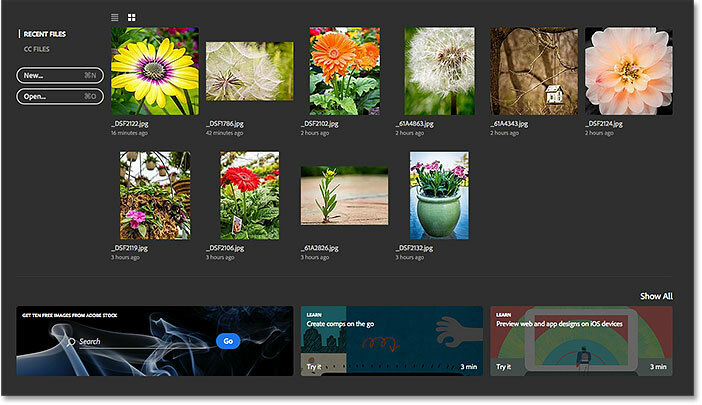 But if you do decide to disable it, or you're just curious to know how to create new documents or open images without the Start screen, here's how to do it. Let's get started! The Start screen in Photoshop CC 2017. Unchecking 'Show "START" Workspace When No Documents Are Open'. Go to File > Exit (Win) / File > Quit Photoshop CC (Mac). Launching Photoshop with the Start screen disabled. Navigating to, and selecting, an image. 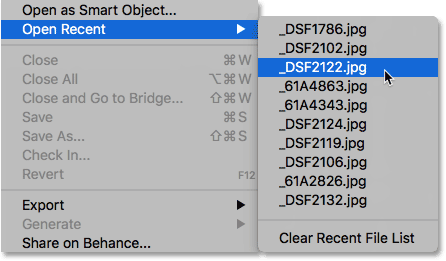 The image opens in Photoshop. © Steve Patterson. 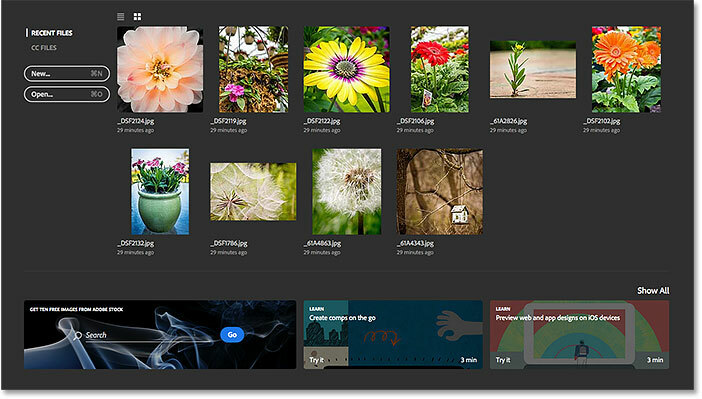 So far, we've learned how to create new Photoshop documents and open images with the Start screen disabled. But how do we re-open a recent file? The Start screen automatically displays our recent files for us, but even with the Start screen disabled, we can still view our recent files just by going up to the File menu and choosing Open Recent. Your recently-opened files will appear in a list. Select the one you need to re-open it. Going to File > Open Recent, then choosing a file to re-open. The second image opens. © Steve Patterson. Reselecting 'Show "START" Workspace When No Documents Are Open'. Launching Photoshop after turning the Start workspace back on. 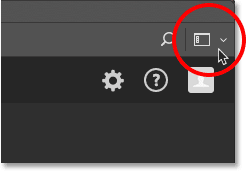 The Workspace icon in the upper right of the Start screen. Clicking the icon opens a list of workspaces that we can choose from. A workspace is a preset collection and arrangement of panels, and can also include specific menu items and keyboard shortcuts. 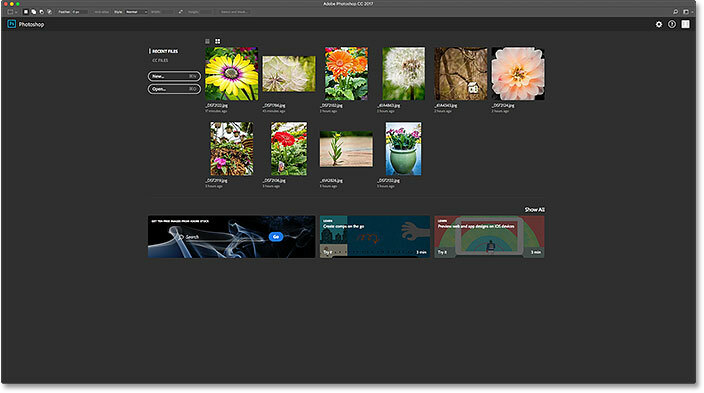 Adobe includes several workspaces in Photoshop, each geared to a specific type of work, like Photography, Graphic and Web, Painting, as well as others. The Start workspace is currently selected. Switching from Start to the Essentials workspace. 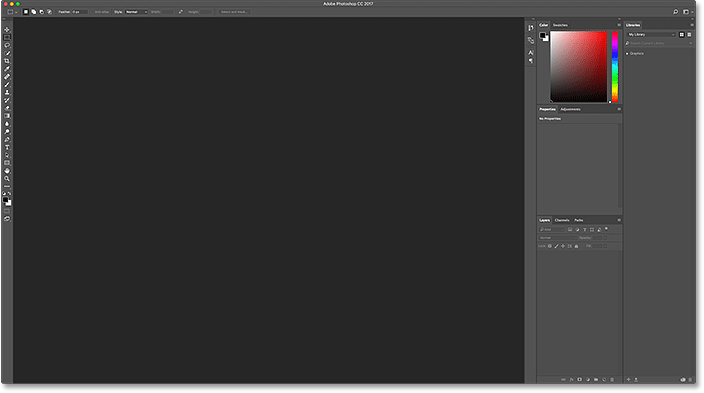 Photoshop after switching from the Start workspace to the Essentials workspace. 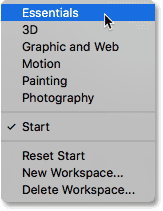 Clicking again on the Workspace icon. Switching from Essentials back to the Start workspace. Back once again to the Start workspace. And there we have it! 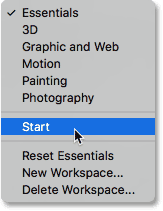 That's how to disable the Start workspace in Photoshop CC, how to create new documents, open images and re-open recent files with the Start screen disabled, and how to temporarily switch from the Start workspace to a different workspace and back again without needing to quit and relaunch Photoshop! One issue we noticed in this tutorial was that, with the Start screen disabled, opening our recent files wasn't quite as easy. That's because the Start screen can display our recent files as thumbnails, yet Photoshop's Open Recent command displays them only by name. 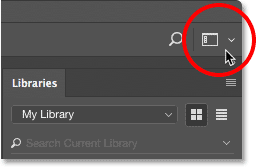 In the next tutorial, we'll learn how to view our recent files as thumbnails whether we're using the Start screen or not by turning on Photoshop CC's hidden Recent Files panel!